So I’m almost 40 years old. No, this is not an exaggeration. My birthday, this year, has me knee deep in feelings and I don’t know how to make it stop! I must admit, I’ve spent a considerable amount of time, looking in the mirror and wondering when the mommy bags under my eyes decided to make permanent residency on my face. I don’t know about you guys, but I’ve never had a legit skin care regime simply because I didn’t think I needed to have one. But this year – oh this year – everything’s changing! And fortunately, Oh So Heavenly has decided to help me “stop the clock” with their delicious range of skin care and facial treatments. And since it’s my birthday, we’ve got a hamper to give away to one of you too! Eeeek! You guys, the Oh So Heavenly Stop The Clock range is divine! Besides for the pretty packaging (Mother’s Day gift, anyone?) and amazing scent, it is also clinically proven to reduce wrinkle depth by up to 15% and improves skin firmness by up to 16%. The range is specially formulated for dry and/or mature skin. The Anti-Wrinkle Complex actually helps to replenish moisture and reduce the signs of wrinkles. With extracts of Argan Oil, Shea Butter, Flower Extract Complex and Avocado, these babies help to increase elasticity in your skin, while keeping it hydrated and fabulous looking. I’ve been using it for the past month and immediately feel a difference on my skin. I love that the Stop The Clock Facial Wash doesn’t leave my skin dry. The Stop The Clock Eye Cream reduces the appearance of mommy-luggage (under the eyes) and the lifting and tightening active ingredients works within 5 minutes to give your eyes a more radiant appearance! 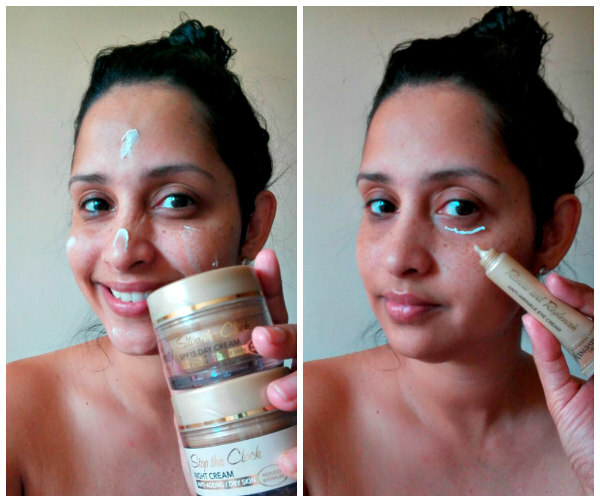 I am totally enjoying the Stop The Clock Day and Night Creams. The night cream boosts cell regeneration and replenishes skin overnight. The day cream has SPF 15 against UVA and UVB sun rays and provides long lasting hydration. 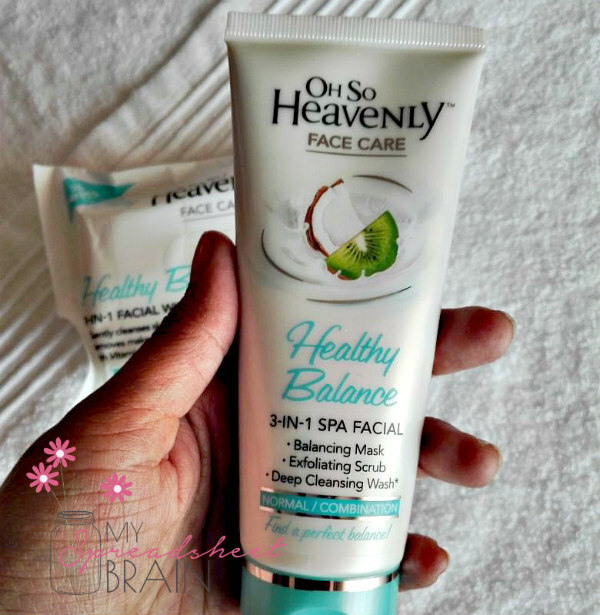 I also tried out the Oh So Heavenly Healthy Balance range. This rich product smells like something I’d like to eat please (it’s the coconut, blame the coconut) and contains milk proteins, omegas and vitamins. The range – filled with good stuff, such as Vitamin A, Vitamin E, Vitamin C, Prebiotics and Coconut Extract – has been specially formulated for normal and combination skin. 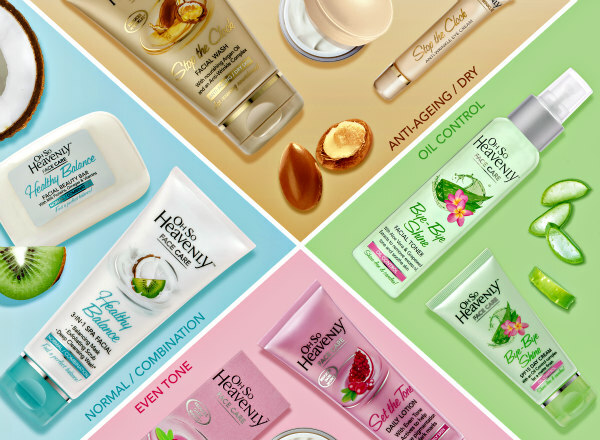 I love that the Oh So Heavenly skin care range caters for everyone. The Oh So Heavenly Set The Tone range is specifically formulated for even skin tones. It improves skin complexion, reducing pigmentation and dark marks. The Oh So Heavenly Bye-Bye Shine range has an Oil Control Complex that reduces shine, to mattify skin. With ingredients such as Green Tea, Grapeseed and Aloe Vera, the range helps to prevent excess oil build up that can cause problem skin. • Normal – soft, smooth and even skin tone with not much oil. • Combination – skin has an oily T-zone (the skin on the forehead, nose and chin). This may be accompanied by larger pores in this area as well. The skin on the cheeks is then drier and may even be patchy or flakey if it is exceptionally dry. • Oily – skin produces oil in all areas (you can pick this up by blotting the skin with a tissue in the morning). It can be caused by hereditary factors, diet, hormone levels, pregnancy or stress to name a few things. • Mature / Dry – skin has a low oil level and may thus feel tight and/or be flakey. • Sensitive – skin is irritated easily and may become inflamed or itchy. 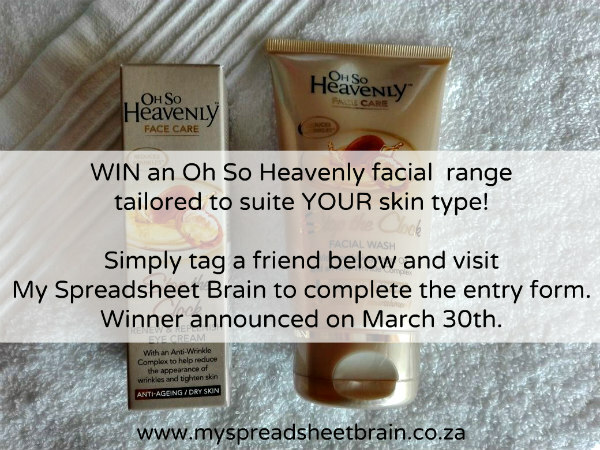 WIN an Oh So Heavenly skin care hamper for YOUR skin! 1. Find the specially marked posts on either Facebook or Instagram, and tag a friend. 4. Winner announced on March 30th! My skin type are normal and it’s blue – my favourite shade! I love this giveaway and will be great to win!! I’ll be 40 in 4months am battling with blackheads and oily skin.